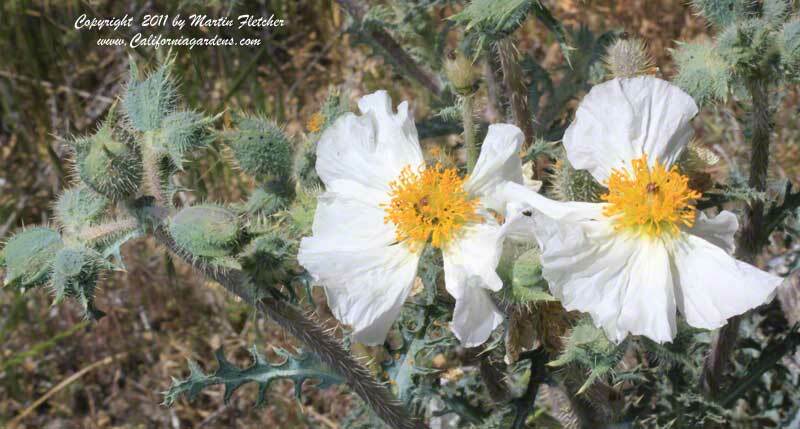 Argemone munita, the Prickly Poppy is spectacular in its wicked aspect and a tough weed to pull. The thorns are for real. Argemone munita grows 3-4 feet tall. The Prickly Poppy is a half hardy perennial, though it seems like they come back more readily from seed than from the original plants. Argemone munita is Summer deciduous if conditions dry out. The Stark spiny silver leaves make this a standout for the silver and grey garden. Argemone munita grows in full sun, in heavy soils to well drained soils and is much more common following a fire. Argemone munita blooms late Spring into Summer until conditions become too dry. Flowers and foliage of Argemone munita the Prickly Poppy. High resolution photos are part of our garden image collection.